There's been a growing disdain for recent Nintendo titles by some of the more critical members of the gaming press. While they continue to get high scores by the modern gaming media, there's an air of concern about the recent direction the games have been taking. The Mario games up to and including World have had their level designs deconstructed thoroughly to an extent like the original Sonic games to the point where its 3D successors are treated with as much respect as Bubsy 3D (This is especially true for the first Super Mario Galaxy). When trailers of Super Mario 3D Land came out, it seemed to continue this presumptuous trend by demonstrating all of the trends that made these people abhor the later games. The question was, would this testament ring true for when the full game was available? No. 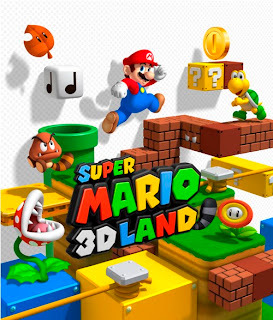 Super Mario 3D Land is a testament to the tightly designed levels of the SNES era and contains such delicate world construction that it's the gaming equivalent of a miracle. It's so well crafted that it's hard to find a good place to start explaining just what about this game is so satisfying. To start with the character, Mario is the perfect simulacrum for the player. He controls exactly the way you want him to without the sloppy controls from Galaxy or the excess baggage in Sunshine, in a world that feels like a progressive journey rather than a closed environment with an assortment of objects like in Super Mario 64 (although this could apply to World as well). This 'lack' of feeling like you are controlling Mario and more of the feeling that you ARE Mario is only extended by the game's amazing 3D effects. Even before the 3DS was released the 3D was addressed as a gimmick. It isn't hard to see why considering that with the success of James Cameron's Avatar almost every movie under the sun was exploiting the trend for all it's worth, and Nintendo made out to capitalise on this by making a whole system revolving around this gimmick. This isn't the case here as the 3D adds a level of depth that handheld games usually aren't known for, allowing for an unconstrained experience marked by its utilisation of the third dimension (the tricks played with depth perception in the Bowser's Castle stages are especially noteworthy). One of the major complaints about the series is Nintendo's increased hand holding and lack of experimentation in terms of maneuverability. In the NES games there was no mentioning of the controls whatsoever, meaning that the player has to figure out Mario's movements themselves through feel of the character alone. World went a step backwards and introduced text boxes spouting expository dialogue and some of the secrets of the game (the addition of Yoshi could be seen as a counterbalance to this). Mario 64 gave more leg room with this by using the castle exterior to explore, however when you have separate sections of the game to explore via the paintings, there's a gaping void in just how much freedom you really have to be creative with the movement of your character (Ironically, Castlevania: Portrait of Ruin did this for entirely different reasons but turned out pretty well in my opinion). Sunshine had an actual tutorial level in the form of the airport fight (at least World was subtle with Yoshi and more importantly, optional) and Galaxy continued to tell you what your character should do over halfway through the entire game! Super Mario 3D Land is a lot like World in this regard. While the counterbalance of Yoshi isn't as necessary as he was in world, all the explanations are there if you really need them. And even then, in a world where all of our questions are solved by GameFAQ's, that's all we really need. This feeds into the claims of the game being too easy, which is a statement that I understand but also disagree with. Super Mario Bros. is taking influence from a harder set of levels similar to Super Meat Boy's dark world (SMB took influence from SMB which is now used in the latest SMB) so when you complete the game's set of 8 worlds (spoilers), you can unlock another set of 8 worlds that require all the skills that the game has 'naturally' taught you and to expand on them allowing for linear, yet free-form level design that has never been accomplished in any Mario platformer ever (or any platformer for that matter). In short, if Kid Icarus: Uprising was proof that Nintendo could still make an original game if they wanted to, Super Mario 3D Land is proof that Nintendo can make a masterpiece if they want to. In an edition of Iwata Asks, the team behind 3D Land talks about how most of them were new to game development and had ideas on how to expand on the series of games that they grew up with. This is confirmation that Super Mario 3D Land is the closest Nintendo has ever been to making an indie game, and we gamers are all the better for it.